Photos which looks like drawn and sketched through pencil has their own look and scenario. It belongs to those who loves photography, people who like to make their photos and images more enjoyable and amazing.For this reason, they can add funny effects to their photos, make it beautiful using online drawing website or can turn photos into pencil sketch. Some people may also do something else i.e make it looks like a cartoon make photo collage etc. I would like to inform those that all these editing in your photos can also be done through online tools and web-apps that let you edit your photos online for free. This post is specialized for those who want to turn their photographs into sketch online for free. We will be sharing some best and free online photoshop that allows you to upload and then make your photos just like these are drawn though pencil. Well, there are lots of tools and websites that converts your photos into sketch online for free.Here is the list of best to choose from. We've tested all of these before listing and these works fine. After testing and looking to it from different angles we've noticed something good and bad features of those websites so we'll be adding a short description for each of the below tool with their pros and cons so you will be easily picking up the one which looks fine for you. I'd like to remind you that we already share some other freebies in past about this topic and here in this post we collected few new and more. I recommend you to read our previous post where you will find some more than this post. Click the link above to read our previous post. SketchMyPhoto is one of the powerful and great tool enables you to turn your photos to sketch online.It is a sketch creation tool for portrait, pets, couple, building, scenery or other memorable moments. It can be used free but their logo will be added to your sketched photo. In order to remove this logo you will need its premium account. You can start converting your photos by clicking on "Browse" button at the top of the left sidebar and then click on 'Convert to sketch'. Photo2sketch is an online free tool letting you convert your digital images to sketches online for free.Turning your photos to pencil sketch using this website is very easy and is worth a few clicks. 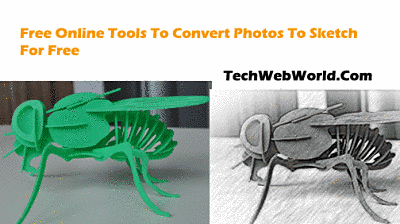 The process of converting images using this tool is that to choose an image from your computer by clicking on "Choose file" button and then click on the black "Convert Photo To Sketch" button so the page refreshes and you see the converted image. you can share this image on facebook directly from there or right click on image and save to your computer. Another easy to use and free tool i found on internet is Snaptouch. This is a free tool and converting image to sketch using this tool is very easy too. 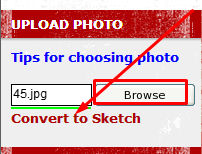 What you will need to do is just to upload your photo from your computer and then clicking on "Sketch It" button. On picjoke pencil drawing effects, I found some great looking sketches effects that you can use for you photos. Actually there will be some pre-made templates so you will have to select one to add your own image replacing the original image in it. You will have to upload an image and click on "Create my image" after selecting a template from the available there. Convertimage.com's online sketch effect enables you to turn your photos to pencil sketch online for free within three steps. These three steps you've to done are 1. Choose output format i.e Png, Gif, jpg, pdf, psd etc 2. Is to choose sketch drawing effect (after uploading) and 3. is to select your image. That's completes our today's collection of free online tools to convert photos to sketch within our browser. I hope you liked our post and tools we mentioned in this post. We tried our best to include the best tools in this collection. If you know about any other then please share it with us in the comment box below.